In folk and traditional cultures, elderberries have been used for centuries for their medicinal properties. Colds, viruses, breathing difficulties, heart problems, constipation and sinus congestion have all been treated with elderberries. The use of these flavorful berries has spanned Europe, North America, Northern Africa and parts of Western Asia, where the shrub is a native species. In the last few decades this folk cure has begun to be studied scientifically, with promising results. A study conducted in Israel has shown that an elderberry extract named Sambucol is at least as effective as pharmaceutical medications in treating flu and its symptoms. Because the flavonoids and other substances in elderberries boost the immune system, they are also being studied in the treatment of cancer and AIDS in Israel. One study using elderberry extract and a placebo found that those taking elderberry extract recovered in two to three days, while those taking the placebo took on average six days to recover from the flu. Most patients had type A flu, but a few had type B flu instead. Other studies have shown that elderberry is also effective against type B and H1N1 flus. The test subjects were started on treatment within the first 48 hours of onset of symptoms. Elderberries have a number of substances that boost the immune system and have other positive effects on the human body. They are high in antioxidant flavonoids, tannin and vitamins A, B and C. Elderberries also contain compounds called anthocyanins. One German study conducted at Bundesforschungsanstalt Research Center proved that anthocyanins in elderberries have more antioxidant ability than vitamins C and E. Anthocyanins have been shown to decrease inflammation, which helps with the body aches and pains typically suffered by flu victims. Unlike pharmaceutical flu treatments, there are no harsh side effects from elderberry extract. They do act as a mild diuretic and laxative, and can cause some sweating. 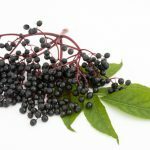 However, because there are no potentially fatal side effects, elderberries can be safely used to treat flu and other viruses in children, the elderly and those with impaired immune systems. Although the flowers, berries and other parts were traditionally used to treat many illnesses, the scientific studies were conducted only with elderberry extract. It is likely, but unproven, that using the berries in their natural state will also have the same positive effects. Jams, wines and other foods prepared with elderberries may not show the same usefulness as treatment for flu or other illnesses. Further research is needed to show whether consuming elderberries or plant parts have the same protective effects.